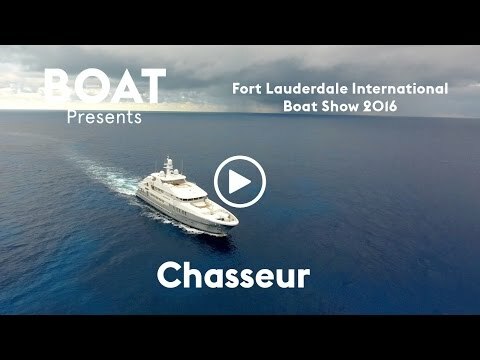 At the recent Fort Lauderdale International Boat Show, American superyacht yard Christensen made a big impression with its latest yacht: the 50 metre Chasseur. We caught up with Jim Gilbert, president of Christensen Shipyards, who explained that one of his favourite spaces on board is the superyacht sundeck. “Chasseur’s sundeck is enormous for a 50 metre,” he added. “You can store tenders and Jet Skis up there and have a party.” To prove this, Christensen exhibited a Bell Ranger 407 helicopter on this spacious deck during the Fort Lauderdale show. A superyacht spa pool adds to the panoply of exterior relaxation options in this area. Moving inside it is clear that Christensen has placed a strong emphasis on allowing light to flow throughout the yacht. The vast untinted windows on the main deck mean that natural light can flood into the saloon, while the spectacular floating glass staircase creates a strong link between the decks. Accommodation on board Chasseur is for 12 guests and 10 crew, split across a main deck owner’s suite and five en-suite doubles on the lower deck. Power comes from a pair of 1,650hp CAT 3512C engines, which can deliver a top speed of 16 knots and a maximum cruising range of 4,000 nautical miles at 14 knots. The full story of superyacht Chasseur is published in the December edition of Boat International and the November edition of ShowBoats International.